I know what you're thinking, "Lena, why are you doing 2 IMMs in one day?" Well, I was surprised with some new books today, and I couldn't wait to share it with you! As you can see, I received an arc of Forget-Her-Nots by Amy Brecount White which I'm starting tonight. I want to finish it and post my review before the release on March 2nd. 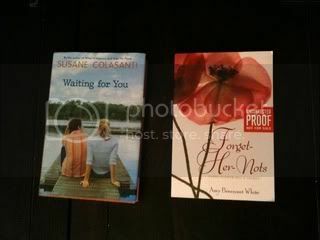 And I also got Waiting For You by Susane Colansanti. Also, stay tuned b/c right after the Going Too Far Contest, I'm starting my March Giveaway. Trust me, it's going to be FABULOUS! Biggest and best one yet! Contest and a good cause?! I'm down!